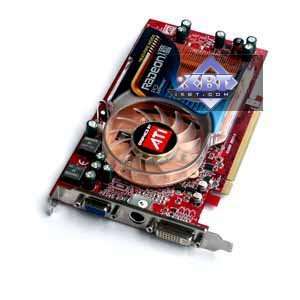 A middle end product - RADEON X800 appeared at the end of 2004. But only 256MB cards were available at that time. They were a complete copy of the reference X800XL design; the only difference from the senior brother was the crippled core and reduced memory frequency. 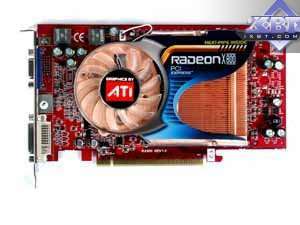 But larger memory capacity of GDDR3 type did not contribute to more or less adequate prices. 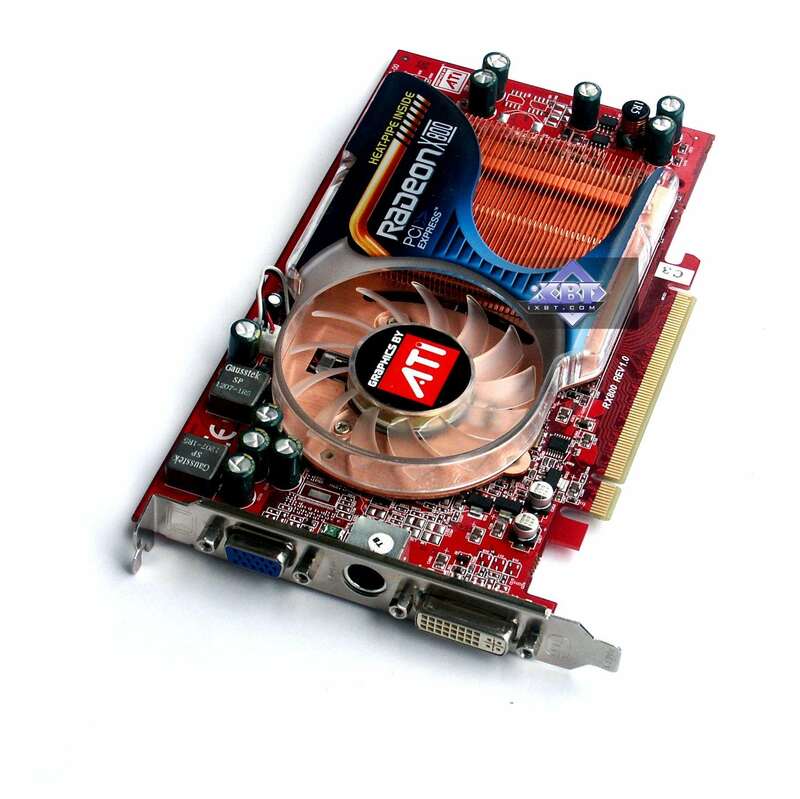 This product competes both with the GeForce 6600GT as well as the GeForce 6800, ranking approximately between them. Launching a 128MB card with DDR1 would drop manufacturing costs and consequently retail prices for such products. But it would require redesigning PCB to support DDR1 and retain the 256bit memory bus. 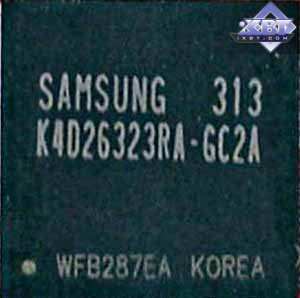 Some companies are tempted not to install half of memory chips on the card and launch the X800 128MB with GDDR3, the old PCB, and the memory bus reduced to 128 bit. Our today's review will include a comparison with one of such cards. Here is the first robin among 128MB and sterling 256MB X800 cards. It's a product from GeCube that will become an object of our review. 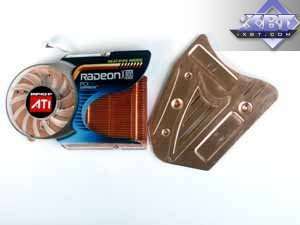 I would remind you that the RADEON X800 is a product for about 200 USD. It officially supports only the 256bit bus (as it turns out it's easily converted to 128bit), it contains 12 pixel and 6 vertex pipelines and supports DirectX 9.0c. 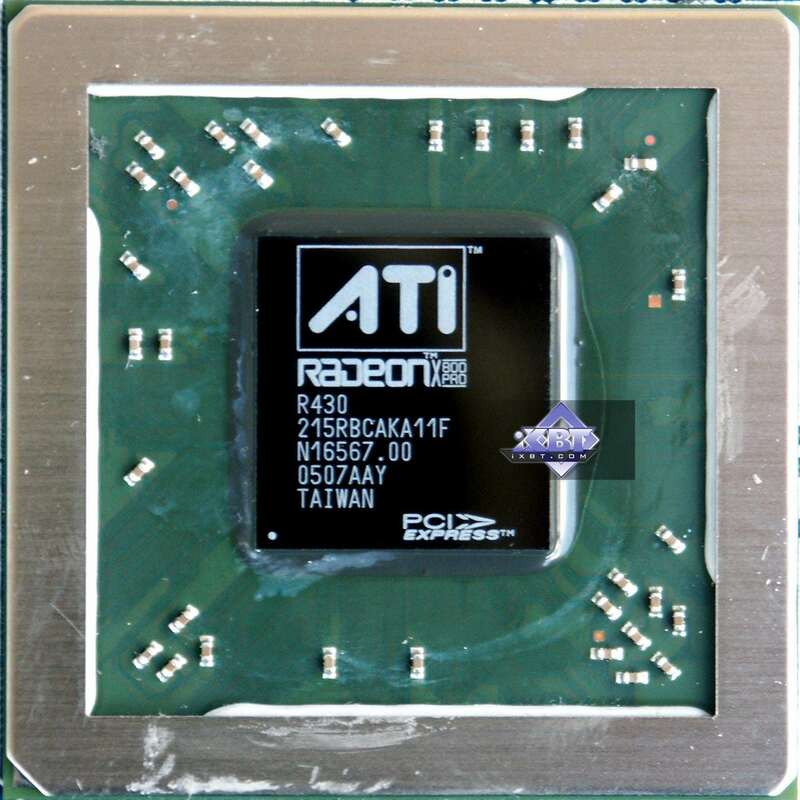 The video card has 128 MB of DDR SDRAM allocated in eight chips on the front and back sides of the PCB. GeCube engineers based their product on a new PCB, with the same 256bit bus, where all seats for memory chips are occupied. 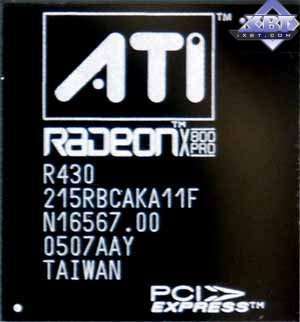 Besides, it uses cheaper memory; such chips have been on the market for at least three years (the first ones were used in the GeForce4 Ti 4600 in 2002). Let's hope that other ATI partners will follow the trail. NEVERTHELESS! WHEN YOU BUY A VIDEO CARD BASED ON RADEON X800, CAREFULLY EXAMINE THE MEMORY BUS. 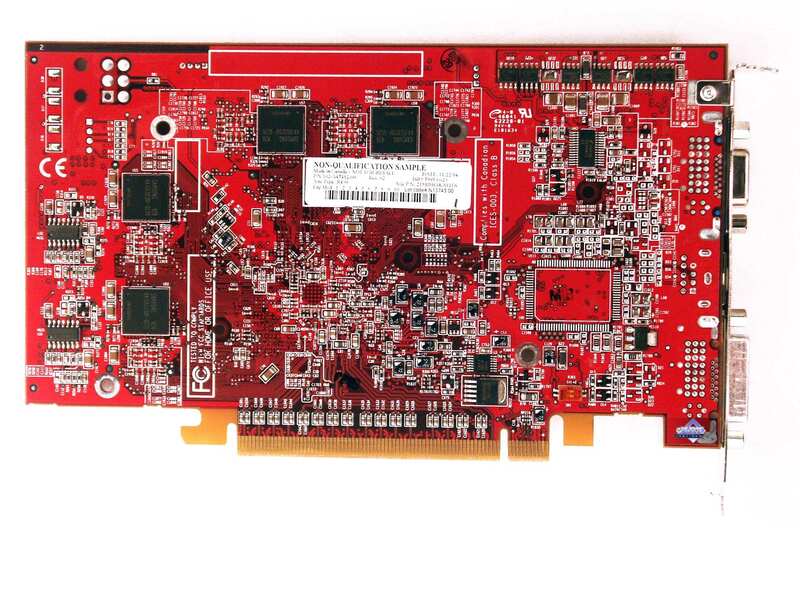 THE MAIN SIGN OF BEING CRIPPLED IS THE LACK OF SOME MEMORY CHIPS ON A CARD. The cooling system is elegant, refined, and even effective; it generates almost no noise! Details are in the video clip (the link is published in the beginning of the article). 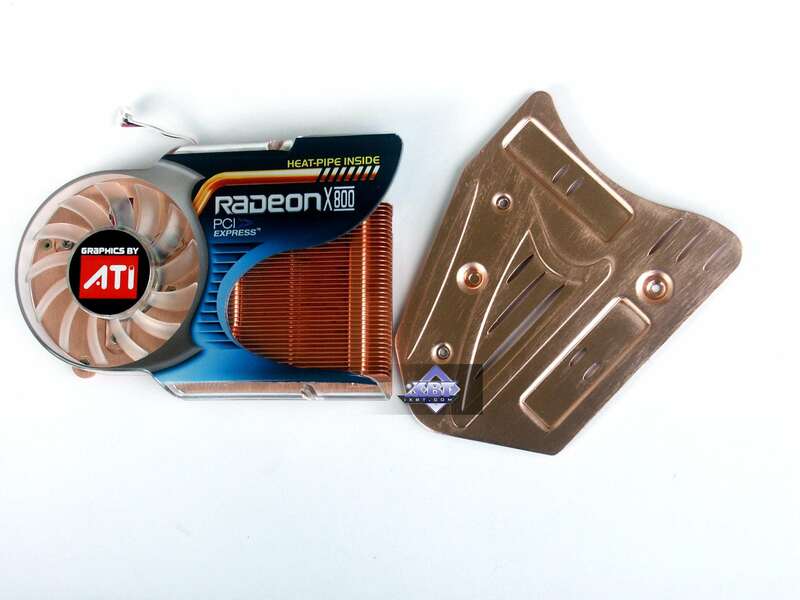 But the back heatsinks are made of aluminum, it's only painted copper. 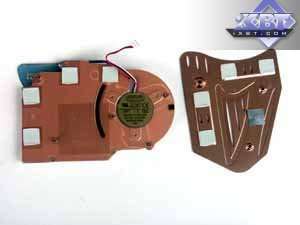 The main heatsink has a copper base. 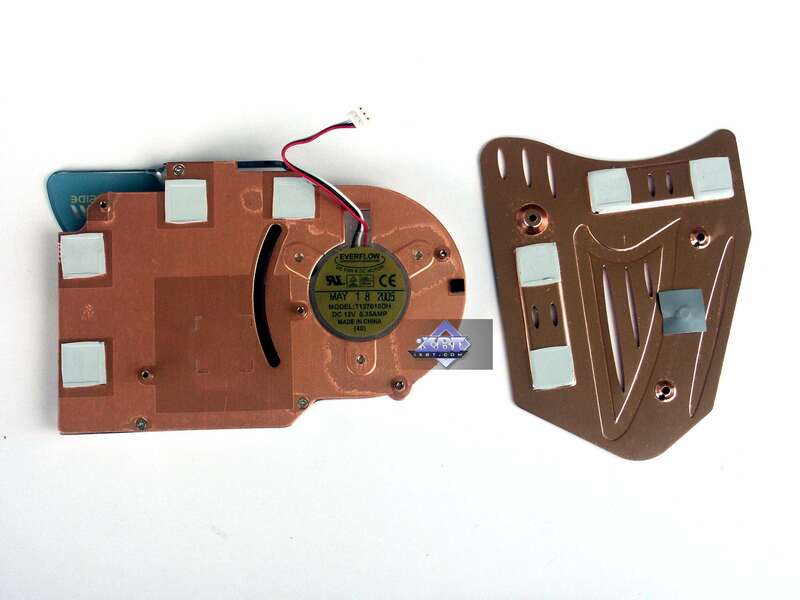 It also has a heat pipe, filled with low-boiling liquid, to amplify the heat removal effect. 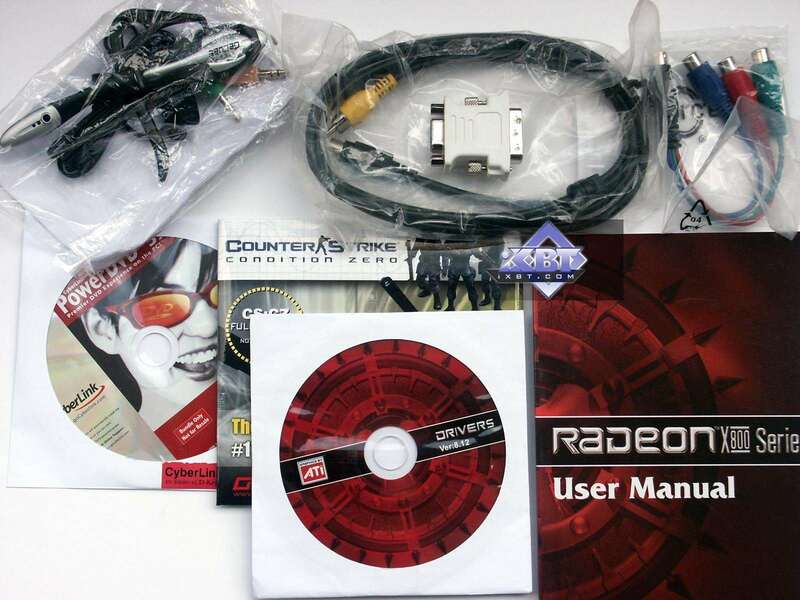 The card traditionally comes shipped with the following items: User's manual, CD with drivers, CD with utilities, TV extension cords, HDTV and DVI-to-d-Sub adapters. And a BONUS: a headset (headphones with a microphone) to be used in internet chats. But it's not clear why this video card's bundle includes a bonus, which seems more appropriate for a sound card. We use this outdated and not very popular game as an example of a classic "shader game", which heavily loads these units. As you can see, the 128MB 256bit card is outperformed by its 256MB counterpart, the largest breakaway is demonstrated with AA+AF. It's easy to explain as the memory on second card operates at 990 MHz instead of 700 MHz. 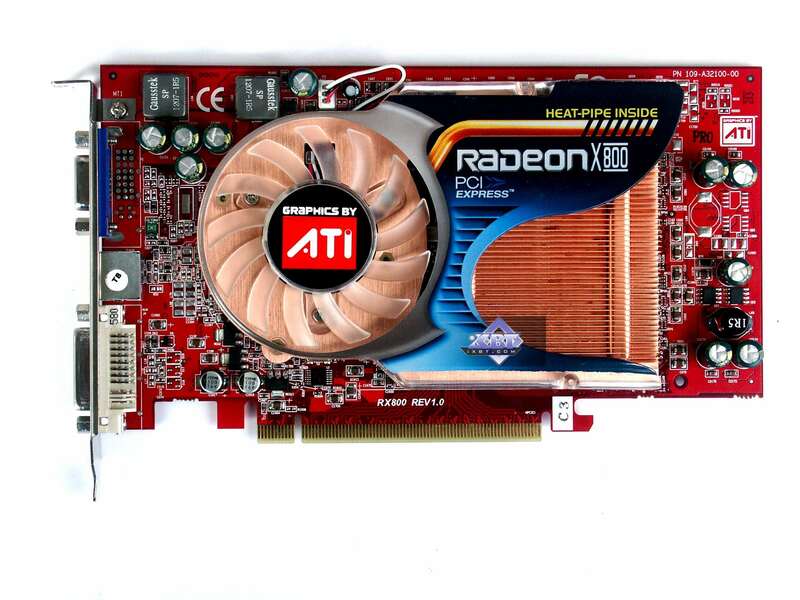 Then, the same accelerator from GeCube (X800 128MB 256bit) outperforms the GeForce 6600GT. 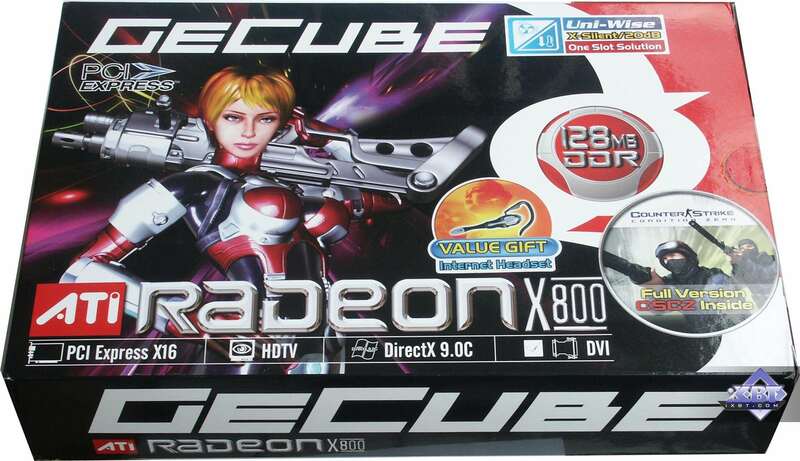 GeCube RADEON X800 128MB 256bit PCI-E is outperformed by the X800 256MB 256bit; the difference reaches 18% in heavy modes. I guess that's the effect of the difference in memory frequencies rather than in the memory capacity. 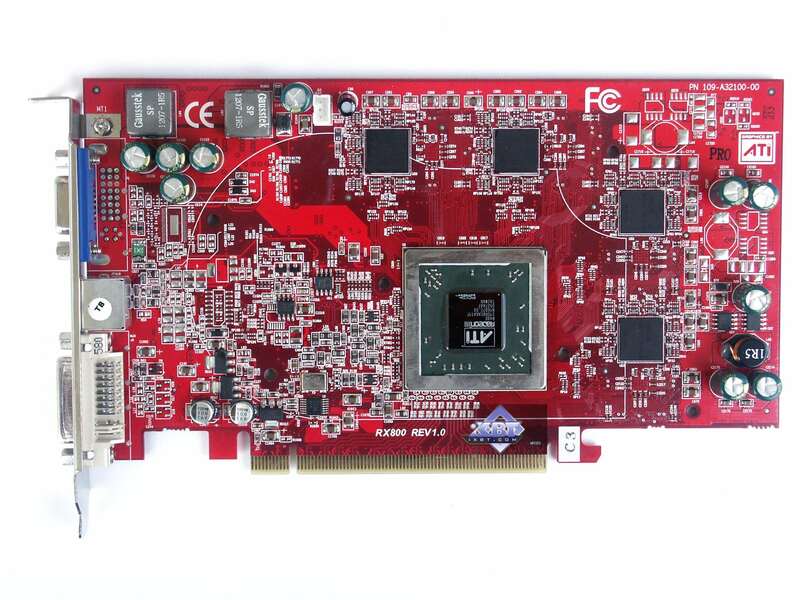 However, this product wins back from the GeForce 6600GT. F.E.A.R. is the latest game; its release is planned for the autumn this year. It loads accelerators heavily, so the results are not so high in absolute FPS with maximum quality. The reason the GeCube RADEON X800 128MB 256bit PCI-E is outperformed by the Gigabyte RADEON X800 256MB 256bit PCI-E (GV-RX80256D) has to do only with different memory frequencies, as the gap grows with increased resolution. The accelerator from GeCube is generally very good. Of course, the X800 256MB turns out the fastest model, but that's the effect of a higher memory frequency. There is nothing much to comment: it's quite clear that the GeForce 6600GT is the strongest here. In other respects the alignment of forces between the two kinds of the X800 remains the same (the fastest X800 card is 256MB, then the X800 128MB 256bit). 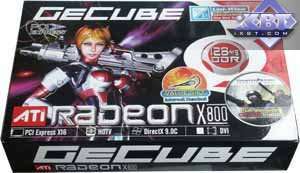 GeCube RADEON X800 128MB 256bit PCI-E is a positive phenomenon. Even though the product is slower than the 256MB modification, I think that in the majority of cases it has to do with different memory frequencies. Unfortunately, we don't have the X800 256MB at 400/700 MHz. But that's not important, because the lags are not so catastrophic, considering the low price for this card relative to the 256MB modification. That's why this card will be successful. And don't forget that the same name of X800 may be used for accelerators not only with different memory frequencies, but also with different bus width.